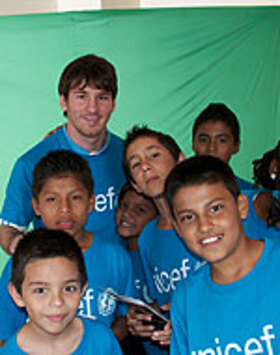 Football legend and UNICEF ambassador Leo Messi was in Costa Rica recently to promote children’s right to sport. Leo Messi meets children from vulnerable communities in Costa Rica. In Costa Rica, UNICEF supports the ‘We All Make up the School’ (‘La Escuela Somos Todos’) education program in 10 primary schools and five secondary schools in the province of Limón. It promotes a quality education that also encourages children’s participation in sports. Leo Messi said that children in Costa Rica should grow up in an environment free of violence and where they are encouraged to play sport. UNICEF has also taken the lead in strengthening ‘Local Protection Systems’, an initiative that supports joint efforts by the Government of Costa Rica, the municipality and civil society organizations in favor of the rights of children and adolescents. 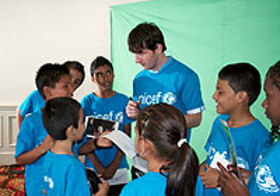 Messi became a UNICEF Goodwill Ambassador in March 2010 and has shown a deep commitment to the organization’s mission. The footballing icon has been on several trips around the world since then, advocating for the rights of the most disadvantaged children, including in earthquake-affected Haiti and China.